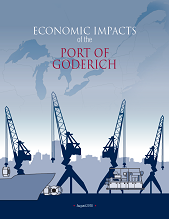 The Goderich Port Management Corporation is a not-for-profit company formed by the commercial port users. The Goderich Port Management Corporation operates the port as an agent on behalf of the Town of Goderich. Managing the Port's finances and assets. Please click the pictures below to see the reports for the Goderich Port.